The China-initiated Asian Infrastructure Investment Bank (AIIB), which had been signed by 51 Prospective Founding Members (PFMs) as of September 2015, is expected to be operational by the end of this year. China has been generally cooperative with and supportive of the Bretton Woods institutions. At the same time, it is frustrated that existing multilateral institutions limit its global ambitions. The slow pace of reforms at the Western-dominated IMF and World Bank prevents China and other emerging economies from playing a greater role in international political economy. The AIIB will help to rectify the situation and boost China’s status as a global power. China has also proposed the “Silk Road Economic Belt” and “21st Century Maritime Silk Road,” or “One Belt, One Road” (OBOR), an even broader and more ambitious initiative. The AIIB will serve as the financing arm of OBOR. 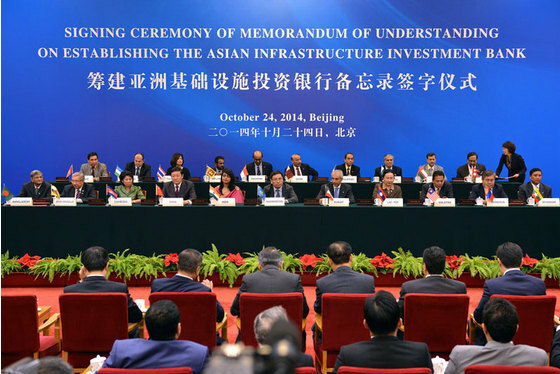 The AIIB will begin with authorised capital of US$50 billion, eventually to be raised to $100 billion. The projected investment for OBOR will be US$1.4 trillion, about 12 times larger than the Marshall Plan, which was about US$120 billion in today’s value. In addition to the economic benefits, the AIIB and OBOR will significantly facilitate the movement of goods, services, and people across national borders. China is transitioning from export-oriented growth to a new model based on consumption and outward investment. This process accelerated after the 2008-9 global financial crisis, which sharply weakened the ability of Western countries to absorb Chinese manufacturing products and to invest in developing countries. China is not just investing in developing countries; it is investing in developed economies as well. According to a recent study by the National Committee on United States-China Relations and Rhodium Group, from 2000 to 2014, Chinese firms spent nearly $46 billion on new establishments and acquisitions in the US, most of it in the past five years. Chinese-affiliated companies now directly employ more than 80,000 Americans. If the US continues to be a major recipient of China’s booming outward investment, it could receive between US$100-200 billion of investment by 2020. This would increase the number of full-time US jobs provided by Chinese US affiliates to somewhere between 200,000 and 400,000. For years the US and its European allies have called China a “free rider,” and urged Beijing to shoulder more international responsibilities. When China attempts to do so, the US becomes suspicious of its intentions and concerned about its growing influence – in short, “damned if you don’t, and damned if you do.” Statements such as US President Barack Obama’s “we cannot allow China to set trade rules” are inconsistent and arrogant from a Chinese perspective. Obviously a new era is dawning. Both the US and China need to adjust to the new global reality. Chinese foreign policy is in transition, and Xi Jinping has emerged as a strong and assertive leader. Despite its great ambitions, the Chinese leadership remains distracted by challenging domestic problems, including rampant corruption, a widening income gap, an aging population, and a deteriorating environment. According to Premier Li Keqiang, 200 million Chinese still live in poverty today. It would be a mistake to perceive China’s new foreign policy initiatives as signs of it abandoning Deng Xiaoping’s international strategy of lying low, in favor of a more aggressive agenda while underestimating the domestic imperatives of such proposals. Some analysts suggest that the AIIB and OBOR are direct responses to the Obama administration’s rebalance to Asia; others consider them as examples of a more confident China attempting to reshape the global order. These may be important factors, but there is a much more significant domestic impetus. For example, many of the infrastructure projects proposed under OBOR would benefit China’s poor inland regions, integrating them with the global economy and helping to mitigate China’s rapidly growing wealth gap. They will also contribute to more balanced and sustainable development and allow China to relocate its labour-intensive and low value-added manufacturing facilities overseas, helping solve the severe environmental problems facing China today. China faces many challenges in implementing the AIIB and OBOR. First, the US and Japan remain non-committal to the AIIB, although that is an improvement from their previous firm opposition. The AIIB will probably function well without the participation of the United States and Japan. But the participation of these two countries is important for China since it will help improve the new bank’s credit rating and give it added legitimacy. China considers the AIIB a new forum for improving relations with Japan and the United States. So China will need to work harder to encourage the US and Japan to join. Security will be another major challenge. For example, as part of OBOR, China will build 81,000 kilometers (about 50,000 miles) of high-speed railway, more than the current world total, involving 65 countries. Who is going to protect so many projects covering so many countries? The Kashgar-Gwadar economic corridor links western China and Pakistan with roads and pipelines and will send electricity to Pakistan. The route passes through some of the world’s most vulnerable and conflict-ridden territory. Many recipient countries in Asia have poor credit, which means many projects may be promising at the beginning but will be difficult to pursue. Agreement and consensus are reached at the top levels of government, but implementation is at the local level. Local governments often do not care about the central government’s policies and do not always cooperate with foreign investors. Some have suggested that the AIIB and the US-led Trans-Pacific Partnership (TPP) could be complementary. The recently agreed TPP will establish the next generation of rules of commerce, or “software” for deeper economic integration. The AIIB, working as a complement to the World Bank and Asian Development Bank, could help finance the “hardware” or infrastructure, in Asia’s emerging economies. The key is how to turn good intentions into real cooperation. There are also legitimate questions as to the extent that the AIIB and OBOR will boost innovation and productivity for China. With slowing economy growth and a falling foreign exchange reserve, funding the AIIB and OBOR may present China with a real challenge. Recent market fluctuations in China may also undermine political support for such grand international projects. China’s ambitious new initiatives are very likely to face some bumps in the road. Zhu Zhiqun is a professor of political science and international relations at Bucknell University, U.S.A.